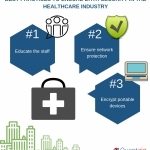 practices to ensure data security in the healthcare industry. breach can also result in the loss of patient’s trust and goodwill. solutions can help protect your institution from data security breaches. suggests a healthcare industry expert from Quantzig. laptops, USB, smartphones, etc. that hold crucial patient information.